We visited Lake Annecy by accident. We emerged from the Alps and realised how close we were to the lake, so thought we'd detour to see it. The problem with unplanned detours is that they are… unplanned! And you often find yourself not taking full advantage of everything a place has to offer- because you didn't plan it in advance. This was exactly the case when we detoured to Lake Annecy with our motorhome. We had nothing planned and we weren't prepared for the prettiness (or business) that is Lake Annecy. We made a LOT of mistakes. If you're ever lucky enough to visit it yourself, here's what to avoid! Lake Annecy is still busy in March! Taking a motorhome to Lake Annecy is not always easy! Touring France by road? Here are 11 things you need to know! Allow enough time to explore the town properly. Don't fly a drone over Lake Annecy without precautions. We thought a drizzly March day would be quiet at Lake Annecy- but we were wrong! There were traffic jams EVERYWHERE. The whole of the west side of the lake going north was one big traffic jam- I was genuinely shocked how much traffic there was. The weather at Lake Annecy changes crazy fast- as does the weather in many mountain towns. There is also a lot of fog/ mist. Pay attention to what is happening around you- not just what the weather forecast says. It was forecast to be gloomy and raining all the time we were there, but when I woke up just before sunrise it was clear and I got some fantastic photos of the lake, like the one above. One big mistake was not preparing anywhere to stay in advance. We hadn't realised that many places shut down for the winter. We also hadn't realised that there are very very very few wild camping spots around the lake- especially for a motorhome. We eventually found a campsite which was open- but the owner wouldn't let us stay as we hadn't booked in advance… even though there were spaces! So we drove on. We found an aire… but all the spaces were tiny and there was no way we were going to fit in. We had to reverse down a tiny street and back out on onto the main road- with the trailer. I'm glad I wasn't driving!! Most of the motorhome parking spots we saw were for vans up to about 7m. Any longer than that (we're about 9m) and you're in trouble! Don't forget you can't prebook aires, so it's the luck of the draw if you find a space or not. Most of the carparks either had low (2m) height barriers or big signs banning overnight parking in vehicles. They obviously have a big problem with motorhomes during the summer. We did eventually find a suitable place to park for the night, quite close to the lake as it happened. I'm not sure how good it would be in summer though- I suspect it will either be full or barred. We didn't see another space near the lake which would be suitable for wild camping- although we didn't go up the east side so perhaps that's better. There seemed to be wild camping spots up in the mountains, but don't plan on walking from there into Annecy- those mountains are STEEP! If you want to stay for a few days, you'll definitely need a campsite. I'll be honest, I'd never seen much of Lake Annecy. I hadn't heard it called ‘The Venice of France'. I hadn't seen the beautiful pictures. It wasn't until we drove into Annecy and saw how pretty it is that we wished we had more time to stop. Sadly, we hadn't left ourselves enough time to really do the city justice and we had to leave without exploring most of the pretty places we passed. It's definitely on our list of places to return to- don't make the same mistake. Our aim is to empty the bucket list- not add to it!! To clarify, it is ok to fly the drone over the lake as long as you are 30m above the waterline and NOT over any people. However, I'm heartbroken to report that our drone is now currently sitting at the bottom of Lake Annecy. A big gust of wind took it as we were hovering to take a photo and blew it into one of the pylons on the pier where we were standing. Mr WB didn't even have time to react before the drone had crashed into the water and sunk. We could still see it's little red light blinking all the way at the bottom- that's how clear the water is!!! 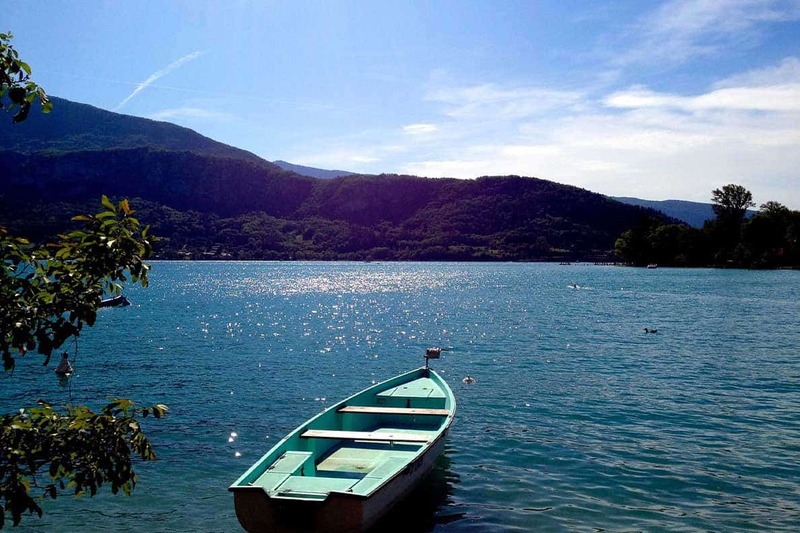 Have you ever visited Lake Annecy? Did you do a better job of it than us? Where was your favourite place?